It’s been a while since an NFC team won the Super Bowl and so far, none of the NFC teams have given us great expectations that things are about to change, except maybe the Minnesota Vikings, who are 2-0, but face some steep completion this week when they travel to Carolina to face last year’s NFC Champions. The Vikings defense has been flawless in the past two games, they completely dominated the Tennessee Titans in game one and again last week against their archrivals the Green Bay Packers, where they only allowed Aaron Rodgers 213 passing yards and one touchdown, forcing 3 fumbles. On the offensive side replacement quarterback Sam Bradford who was recently acquired from the Eagles, seems to have turned out to be a near perfect fit for the Vikings, in his first start with Minnesota last week, he went 22-31 for a total of 286 yards, which resulted in two touchdowns and no interceptions, pretty impressive if you ask me for a guy who has been with the team for about 2 weeks. But this week will be tough for Minnesota, their star running back Adrian Peterson injured his knee on Sunday and will need to undergo surgery and is unsure when if at all he will return to the field this season; which means the Vikings will probably rely heavily on running backs Matt Asiata and Jerick McKinnon which will make their offense a lot more unpredictable. The Carolina Panthers on the other hand have a very tough offense, with Cam Newton who is a double threat both in passing and running plays; containing him will be key for the Vikings holding on to their undefeated status. They will also need to block the Carolina go to receivers, Wide Receiver Kelvin Benjamin who although not the fastest guy on the field, he is big and hard to bring down, and one of the league’s best Tight Ends Greg Olson who has over 1000 receiving yards in the last two seasons. 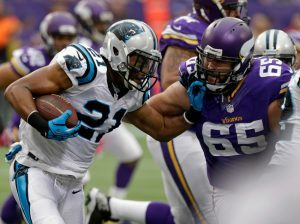 One bit of good news for the Vikings this week is that the Panthers main running back Jonathan Steward will most likely miss Sunday’s game due to a pulled hamstring, but it is uncertain how much that will affect the Panthers rushing game. In order for the Vikings defense to contain Carolina’s rushing game, they need to put as much pressure as they can on Cam Newton, who has shown some important vulnerabilities when under pressure. It will be a hard day’s work for the linebackers for sure, but the entire defense has to rally as a team if they want to stop the Panthers powerful offense who has a reputation for stretching even the best defensive lineups. Offensively the Vikings need to play more like they did against the Titans, a team that resembles the Panthers a bit more considering their previous two games, then Sam Bradford could have a good passing game, however, they need to improve on their third down conversions and they need to hold on the ball for longer periods in order to limit the Panthers offense. Although Carolina has not performed as expected so far, I think they have the upper hand playing at home against the Vikings, there are just too many things that need to happen for the Vikings to control the Panthers and I don’t believe they can do it. My pick in this game is Carolina. Make sure to visit www.AceSportsbook.com for pro football lines on your favorite NFL teams.